Yes, there is rubble, in fact total destruction, in some of the neighborhoods of Homs, Aleppo, in the outskirts of Damascus, and elsewhere. Yes, there are terrorists and ‘foreign forces’ in Idlib and in several smaller pockets in some parts of the country. Yes, hundreds of thousands of people lost their lives and millions are either in exile, or internally displaced. But the country of Syria is standing tall. It did not crumble like Libya or Iraq did. It never surrendered. It never even considered surrender as an option. It went through total agony, through fire and unimaginable pain, but in the end, it won. It almost won. And the victory will, most likely, be final in 2019. Despite its relatively small size, it did not win like a ‘small nation’, fighting guerilla warfare. It is winning like a big, strong state: it fought proudly, frontally, openly, against all odds. It confronted the invaders with tremendous courage and strength, in the name of justice and freedom. Syria is winning, because the only alternative would be slavery and subservience, and that is not in the lexicon of the people here. 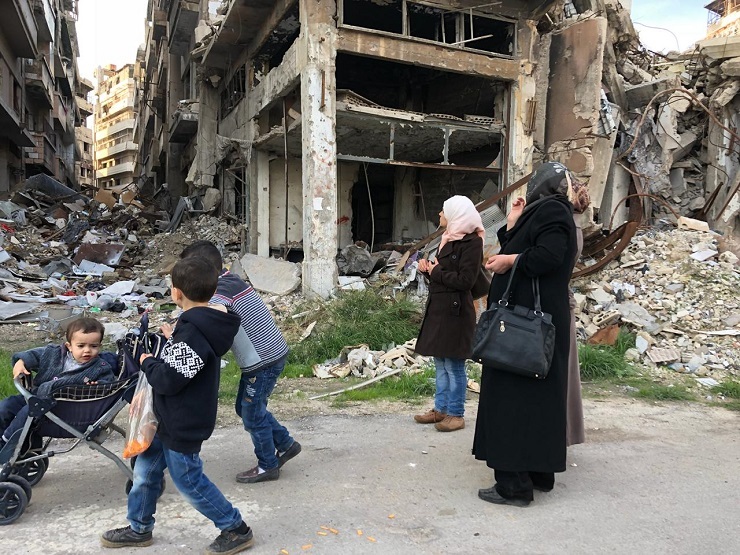 The Syrian people won because they had to win, or face the inevitable demise of their country and collapse of their dream of a Pan-Arab homeland. Syria is winning, and hopefully, nothing here, in the Middle East, will be the same again. The long decades of humiliation of the Arabs are over. Now everyone ‘in the neighborhood’ is watching. Now everybody knows: The West and its allies can be fought and stopped; they are not invincible. Tremendously brutal and ruthless they are, yes, but not invincible. The most vicious, fundamentalist religious implants can be smashed, too. I said it before, and I repeat it here again: Aleppo has been the Stalingrad of the Middle East. Aleppo and Homs, and other great courageous Syrian cities. Here, fascism was confronted, fought with all might and with great sacrifice, and finally deterred. I sit in the office of a Syrian General, Akhtan Ahmad. We speak Russian. I ask him about the security situation in Damascus, although I already know. For several evenings and nights, I have been walking through the narrow winding roads of the old city; one of the cradles of human race. Women, even young girls, were walking as well. The city is safe. I nod. He is a top Syrian intelligence commander. I should have asked more, much more. Details, details. But I don’t want to know details; not right now. I want to hear again and again that Damascus is safe, from him, from my friends, from the passers-by. I tell him that I have. That I have been doing it since I arrived. I get several permits signed. I take the General’s photo. I get photographed with him. He has nothing to hide. He is not afraid. I tell him that at the end of January of 2019, or in February at the latest, I want to travel to Idlib, or at least to the suburbs of that city. That’s fine; I just have to let them know a few days in advance. Palmyra, fine. Aleppo, no problem. We shake hands. They trust me. I trust them. That’s the only way forward – this is still a war. A terrible, brutal war. Despite the fact that Damascus is now free and safe. After I leave General’s office, we drive to Jobar, on the outskirts of Damascus. Then to Ein-Tarma. There, it is total madness. Jobar used to be a predominantly industrial area, Ein-Tarma a residential neighborhood. Both places had been reduced almost entirely to rubble. In Jobar I am allowed to film inside the tunnels, which used to be used by the terrorists; by the Rahman Brigades and by the other groups with direct connection to Al-Nusrah Front. The scene is eerie. Formerly these factories offered tens of thousands of jobs to the people of the capital city. Now, nothing moves here. Dead silence, just dust and wreckage. A Few kilometers further east, in Ein-Tarma, things are very different. Before the war, this used to be a residential neighborhood. People used to live here, mostly in the multi-story buildings. Here, the terrorists hit hard at the civilians. For months or even years, families had to live in terrible fear and deprivation. We stopped at the humble shop selling vegetables. Here, I approached an elderly lady, and after she agreed to it, I began filming. She calls her president by his first name. She points palms at her heart, and after kissing them, she waves her hands again. There is nothing to ask, really. I just film. She says it all, in two minutes. As we are leaving, I realize that she is most likely not old; not old at all. But what has happened here broke her in half. Now she is living; she is living and hoping again. I ask my driver to move slowly, and I begin filming the road, broken and dusty, but full of traffic: people walking, bicycles and cars passing by, negotiating potholes. In the side streets, people are hard at work, rebuilding, cleaning rubble, cutting fallen beams. Electricity is getting restored. Glass panels fitted into the scratched wooden frames. Life. Victory; all this is bittersweet, because so many people died; because so much has been destroyed. But life it is, despite everything; life again. And hope; so much hope. I sit with my friends, Yamen and Fida, in a classic, old Damascus café, called Havana. It is a real institution; a place where Ba’ath Party members used to meet, during the old and turbulent days. Photographs of President Bashir al-Assad are displayed, prominently. Fida, Yamen’s colleague, is taking care of her ageing mother, every day, when she gets back from work. Life is still tough, but my friends are true patriots, and this helps them to cope with the daily challenges. “Salamiyah used to be just terrible. Many villages had to be evacuated… Many people died there. To the East of the city were the positions of Al-Nusrah, while the west was held by the ISIS”. Yes, hundreds of thousands of the Syrian people were killed. Millions forced to leave the country, escaping both the terrorists and the conflict as well as poverty that rode on the tail of the fighting. Millions have been internally displaced; the entire nation in motion. The previous day, after leaving Ein-Tarma, we drove near Zamalka and Harasta. Entire huge neighborhoods were either flattened, or at least terribly damaged. When you see the Eastern suburbs of Damascus, when you see the ghost buildings without walls and windows, with bullet holes dotting the pillars, you think that you have seen it all. The destruction is so huge; it looks like an entire big city was just blown up to pieces. They say this eerie landscape doesn’t change for at least 15 kilometers. The nightmare goes on and on, without any interruption. So yes, you tend to think that you have seen it all, but actually you haven’t. It is because you have not visited Aleppo, nor visited Homs, yet. For several years, I have been fighting for Syria. I was doing it from the peripheries. I managed to enter the Israeli-occupied Golan Heights and to file reports about the brutality and cynicism of the occupation. For years, I covered life in the refugee camps, and ‘around them’. Some camps were real, but others were actually used as training fortresses for the terrorist, who were later injected into Syrian territory, by NATO. Once I almost disappeared while filming Apayadin, one of such ‘institutions’, erected not far from the Turkish city of Hattay (Atakya). I ‘almost’ disappeared, but others actually did die. Covering what the West and its allies have been doing to Syria is as dangerous as covering the war inside Syria itself. I worked in Jordan, writing about the refugees, but also about the cynicism of the Jordanian collaboration with the West. I worked in Iraq where, in a camp near Erbil, the Syrian people were forced by both the NGO and the UN staff, to denounce President Assad, if they wanted to receive at least some basic services. And of course, I worked in Lebanon, where more than one million Syrian people have been staying; often facing unimaginably terrible conditions as well as discrimination (many are now going back). And now that I was finally inside, it all felt somehow surreal, but it felt right. Syria appeared to be as I expected it to be: heroic, brave, determined, and unmistakably socialist. Homs. Before I went there, I thought that nothing could surprise me, anymore. I have worked all over Afghanistan, in Iraq, Sri Lanka, East Timor. But soon I realized that I had seen nothing, before I visited Homs. The destruction of several parts of the city is so severe that it resembles the surface of another planet, or a fragment from some apocalyptic horror film. People climbing through the ruins, an elderly couple visiting what once used to be their apartment, a girl’s shoe that I find in the middle of the road, covered by dust. A chair standing in the middle of an intersection, from which all four roads lead towards the horrid ruins. Homs is where the conflict began. Homs is where the anti-government rebellion began, in 2011. The anti-Assad propaganda from abroad soon reached a crescendo. The opposition was ideologically supported by the West and by its allies. Rapidly, the support became tangible, and included weapons, ammunition, as well as thousands of jihadi fighters. A once tolerant and modern city (in a secular country), Homs began changing, getting divided between the religious groups. Division was followed by radicalization. In the West, they often say that the Syrian government was at least partially responsible for destruction of the city. But the logic of such accusations is absolutely perverse. Imagine Stalingrad. Imagine foreign invasion; an invasion supported by several hostile fascist powers. The city fights back, the government tries to stop the advancement of the troops of the enemy. The fight, terrible, an epic fight for the survival of the nation goes on. Who is to blame? The invaders or the government forces who are defending their own fatherland? Can anyone accuse the Soviet troops for fighting in the streets of their own cities that were attacked by the German Nazis? Perhaps the Western propaganda is capable of such ‘analyses’, but definitely no rational human being. The same logic as to Stalingrad, should also apply to Homs, to Aleppo, and to several other Syrian cities. Covering literally dozens of conflicts ignited by the West all over the world (and described in detail in my 840-page long book “Exposing Lies Of The Empire”), I have no doubts: the full responsibility for the destruction lies on the shoulders of the invaders. I face Mrs. Hayat Awad in an ancient restaurant called Julia Palace. This used to be the stronghold of the terrorists. They occupied this beautiful place, located in the heart of the old city of Homs. Now, things are slowly coming back to life here, at least in several areas of the city. The old market is functioning, the university is open, and so are several government buildings and hotels. But Mrs. Hayat lives in both past and the future. Mrs. Hayat lost her son, Mahmood, during the war. His portrait is always with her, engraved into a pentel she is wearing on her chest. Are there many mothers like her, here in Homs, those who lost their sons? After I am done filming, she thanks Russia for their support. She thanks all the countries that have stood by Syria, during those difficult years. Not far from Julia Palace, reconstruction work is in full swing. And just a few steps away, a renovated mosque is re-opening. People are dancing, celebrating. It is Prophet Mohammed’s birthday. The Governor of Homs marches towards the festivities, with the members of his government. There is almost no security around them. If the West does not unleash yet another wave of terror against its people, Homs should be just fine. Not right away, perhaps not soon, but it will be, with the resolute help of the Russians, Chinese, Iranian and other comrades. Syria itself is strong and determined. Its allies are mighty. I want to believe that the most terrible years are over. I want to believe that Syria has already won. But I know that there is still Idlib, there are also pockets occupied by Turkish and Western forces. It is not over, yet. The terrorists have not been fully defeated. The West will be shooting its missiles. Israel will be sending its air force to brutalize the country. And the mass media outlets from the West and the Gulf, will continue fighting the media war, agitating and confusing certain segments of the Syrian people. Still, as I leave Homs, I see shops and even boutiques opening in the midst of the rubble. Some people are dressing up, elegantly again, in order to show their strength; their determination to put the past behind them and to live, once again, their normal lives. Returning to Damascus, the motorway is in perfect condition and the industrial area in Hassia is getting rebuilt and amplified, too. There is a huge power plant, supported by the Iranians, I am told. Despite the war, Syria is still supplying neighboring Lebanon with electricity. Yamen drives at 120 km/h and we joke that once we get scared of possible speed traps, instead of snipers, we know that the situation in the country is dramatically improving. A Russian military convoy is parked at a rest area. Soldiers are drinking coffee. There is no fear. Syrians treat them as if they were their own people. I see the most spectacular sunset, over the desert. Then, once again, we pass through Harasta. This time at night. I want to curse. I don’t; cursing is too easy. I need to get to my computer, soon. I have to write; to work. A lot, the best I can. It is easy to feel at home in Syria. Maybe because Russian is my mother-tongue or perhaps because people here know that I have always stood by their country. Some bureaucratic hindrances got resolved, quickly. “My Ministry of Education has been, in fact, the Ministry of Defense”. Last night in Damascus I walked all over the old city, till early morning. At one point, I arrived near the spectacular Umayyad Mosque, finding, right behind it, the mausoleum of Sultan Saladin. I could not enter. At this late-night hour it was locked. But I could easily see it through the metal bars of the gate. This brave commander and leader fought against the huge armies of the Western invaders – the Crusaders – winning almost every single battle, finding his peace and final resting place here, in Damascus. Perhaps his spirit did. Or, more likely, some battles were fought and won with his name on lips. ‘I will be back,’ I uttered, walking back towards my hotel, few minutes after midnight. Two massive furry cats accompanide me, following my steps until the first corner. ‘I will be back very soon’. Syria is standing. That’s what really matters. It never fell on its knees. And it never will. We will not allow it to fall.